Transport For London is in discussions with mobile phone firms in a bid to get full telephone coverage throughout the Underground. At the moment, it is possible to get mobile phone coverage in many stations and on parts of the network that are above ground. Many stations also have Wi-Fi. However, getting calls between stations is not possible. Often you see people mid-conversation as they leave a station, getting cut off as soon as they are a few yards into the next tunnel. Their frustration is obvious. London is rather late to the underground phone party. You can make calls underground in Hong Kong, Sydney, Berlin and Paris, amongst others. Even Glasgow had the capability to make and receive calls in its subway system before London. Tokyo, though, is the most interesting. It has full subterranean mobile phone access for commuters, but the politeness of the Japanese people means that generally they switch their phones onto silent when travelling and don’t make calls between stations. Plus, it appears that we are increasingly shunning the use of mobile phones. But why is Transport for London pushing ahead with this multi-million-pound scheme? Clearly, they face competition for transport – people can use taxis, take an Uber, or a bus and get mobile phone coverage above ground. Goodness me, they can even walk around the streets of London and use their phone. 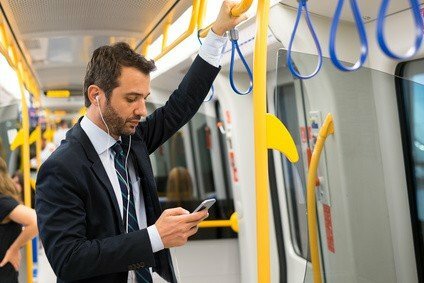 So, to tempt people underground, there is the possibility that having mobile phone coverage between stations removes the competitive advantage of other forms of transport. There is also the image and PR side, where the London Underground can be seen as something which is technically advanced, at the leading edge (in spite of being more than 150 years old). However, there could be a backlash. Passengers might begin to avoid the tube if they have to endure journeys with people around them chattering on the phone all the time. It’s much easier to avoid annoying phone users on the London Underground than it is on surface trains because journey times are much shorter and there are more alternative forms of transport. Furthermore, it will reduce the number of people looking at advertising inside tube trains. That could lead to advertisers pulling out due to lack of impact, thereby reducing the income for Transport For London. Five psychological reasons why you don’t need mobile phones on the underground. There are, though, five psychological and biological reasons why we don’t need mobile phone access on the underground. Constant communication is simply not good for you. Your brain needs a break. It needs the space in which to process things that have been going on before. Constantly being in touch means your brain has less time to do that processing, which leads to cognitive inefficiency. In other words, you become less mentally capable. The regular use of mobile phones provides you with an ever-rising amount of “blue light”. This fools your body into a hormone cycle of wakefulness. In turn, this disrupts your sleep patterns. The more you look at your mobile phone, the lower the quality of sleep you get. People are becoming more sleep-deprived, leading to inefficiency in their work. An opportunity to use your mobile phone more will merely add to poorer sleep quality. People constantly using their mobile phones are suffering from a variety of musculoskeletal conditions. Having your arm permenantly bent and holding a weight is not good for it. Your muscles, ligaments, tendons and the circulation need more variety. Providing people with an opportunity to keep their phone glued to their head as they travel will add to the possibility of increased physical problems in phone users. When you read a book you know there is an end. When you watch a movie, you know there is a finish. When you travel on a plane you know there is a final destination. Much of what we do has a defined end point. That helps our brains which prefer certainty. Constant mobile phone usage, that never-ending communication, doesn’t have a clear end. We will enter the tube system knowing that mobile phone usage is still possible – compared with the current situation of a clear end when we go into a tunnel. This never-ending ability to receive communication means our brains become less certain. Lack of certainty raises stress hormones. The “always on” world of communication means reduced certainty and that just raises stress at work. Knowing that you can always be contacted means you don’t relax. Going into a tube train nowadays means you know you cannot be contacted and that helps you relax. Relaxation, even for short spells, is vital. It helps in a variety of biological and psychological ways including raising pleasure endorphins. Even if you think you need to make calls whilst hurtling between stations, you are mistaken. The average journey time between London Underground stations is less than two minutes. Even if someone had a major artery severed you’d have the ability to travel between two stations before it was a real problem. Nothing is so “life and death” that it cannot wait two minutes, no matter what your boss says…! You don’t need mobile phone access between stations on the underground, no matter what the phone companies or Transport for London might tell you. Constant communication has psychological issues so you don’t need mobile access on the tube.